It's been a busy few weeks hence me having a bit of a blogging break. I am at last back in a place where I feel that I'm re-establishing a balance. I don't know about you but when I have lots going on it sometimes feels like I don't get anything finished or achieved, and things I love doing slip off the agenda. For me over the past month or so my day job has dominated each week. I've been working on a few large projects, trying to juggle them with my day to day tasks and changing priorities, it has led to a particularly challenging but interesting month. I'm continually surrounded by changes, a reactive workload and daily shifts in focus that impact on my role. Sometimes it makes me feel that I don't know if I'm coming or going, as I jump from quick win to quick win but I seem to get lots achieved and I enjoy the challenge. I wanted to share with you how I'm regaining balance in my life after a busy period of time at work. I recognise that my day job will always be busy and that I'll structure my working day with a focus on key priorities, delivering as much as possible. But what I have noticed is that at end of the day I've missed prioritising the time I put into myself outside of working hours. It just didn't seem as productive outside of work as I am in the office. I was coming home tired and not wanting to do anything for myself. I felt that it was time to address it and regain some balance. I think we can all have phases and seasons in life where we find ourselves slipping away from how we want to live. I'm determined that when it happens, I recognise it and get life back into balance as quickly as I can. For the past three weeks I've been determined to use more of my spare time to fit in the things I love doing. 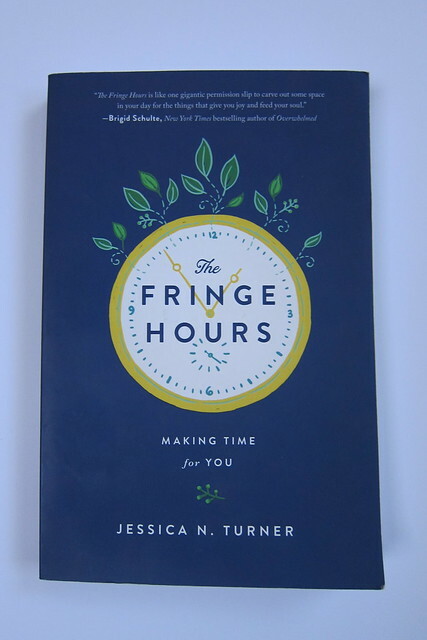 Inspired by The Fringe Hours by Jessica Turner (see my last blog post about the book), I've been thinking about what makes me tick and trying to work out how to fit in more of what I love doing. I decided to start a new routine to try and fit more of a variety of things in before and after work. Since the new routine started about three weeks ago I've been getting up 20 minutes early to head up to our attic room and do yoga before getting ready for work. At first getting up early was hard but I felt the benefits by day three and now it is part of my weekday routine. Yoga, with its gentle stretching and breathing, starts the day off perfectly for me. I've had a break from yoga for quite a few years and I am a lot less supple than I used to be. However every few days I can feel my body stretching further and gradually perfecting the poses. I love yoga as it's the type of exercise that is progressive and one where you can take small steps. What gets me out of bed early is how calm and ready I feel for the day having started it with yoga. I love standing in the early morning sunlight and taking time for me before the day begins. I'm noting down in my diary when I do yoga so that I can keep track of things in my new routine and feel a sense of achievement. I think the focus I have put on myself has helped balance things in other areas too. I've started really thinking more about what I'm eating during the day. In the mornings for breakfast I switched my normal cows milk for almond milk on my porridge and have started adding seeds and more blueberries to make it feel more satisfying. Each morning I've made time in my routine to make a salad for my lunch, packed full of colourful vegetables, seeds and protein. It has definitely been a good move as it is a lunch I really look forward to and it fills me up. I've had a few slip ups at work (heading to the vending machine for chocolate!) on very busy days but those aside, each day I'm having more fruit, seeds and nuts to keep me fuelled and energised. As well as a new morning and lunchtime routine I've also tried to gradually add new things into my evenings too. Whether it's cooking something new, spending time on my crochet or sewing projects, reading a book or magazines, or catching up on admin or housework. I'm making a conscious effort to spend less time watching TV and doing more small tasks during the week. I used to lump together lots of tasks into the weekend and could never get them all done. However with my new routine I'm using more of my weekday fringe hours, freeing up the pressure I put on the weekend to complete a list of tasks and having more time available to see friends, family and work on projects. I'm someone who is organised but sometimes things are not quite as organised as I'd like them to be. Getting a few things achieved in the week before and after work helps clear my mind and gives me a sense of personal achievement. Tonight was one of those moments for me. I left work late, read my book on the train and wanted to fit something else in...I was determined to write this blog post. I just wanted to write and post on my blog mid-week to mix up my normal routine and see how it went. For me finding more fringe hours in the day has felt like a gradual process, one that is continually moving forwards and changing. I've started to work out what I can fit in and realistically achieve in the fringe hours of the day. Changing my morning and evening routines has helped make a start in regaining more of a balance in my life. I feel that I'm achieving more and this makes me feel more alive and happy...When I settle down at my desk at work each weekday morning I love the feeling I have knowing that I've already fitted more into my day than I did a month ago. I wonder what else I will fit in to my day over the next month...I'll let you know. Have you thought about your fringe hours and how you could be fitting more in? I'd love to hear about what you are doing.